The Holiday Inn Phoenix West is conveniently located off I-10, 6 miles West of Downtown Phoenix. Complimentary 24-hour shuttle service that goes within a 5 mile radius of the hotel. Enjoy daily food and drink specials at The Coyote Bar and Grill or order room service until 9pm daily. This full service hotel appeals to both leisure and business travelers offering a 24-hr business center, free wireless internet throughout the hotel, on-site fitness center, and heated outdoor pool and spa. Our updated guest rooms feature 32in flat screen HDTV, plush bedding, microwave, mini-refrigerator, coffeemaker, and a complimentary newspaper (USA Today). There is also meeting space that can accommodate up to 250 people. 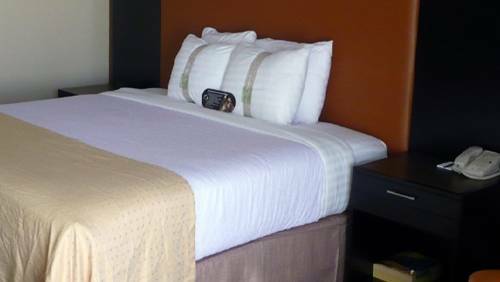 This hotel is just minutes away from Phoenix International Raceway, Ak Chin Pavilion, Wet N Wild, Westgate City Center, University of Phoenix Stadium - Arizona Cardinals, Gila River Arena - Phoenix Coyotes, Chase Field - Arizona Diamondbacks, Talking Stick Resort Arena - Phoenix Suns, and many restaurants, bars and retail shops. WestgateWestgate City Center with fantastic dining and shopping opportunities, Glendale's Arrowhead Mall is just a few miles north of the Westgate City Center with numerous shops and restaurants. Arrowhead Mall2 story mall with over 50 different name brand shopping for your pleasure with a large food court, and cinema for movies for a night out. Aguila Municpal Golf Course18 hole Championship golf course with 9 holes executive. Full driving range, short game area and large putting green. Resonable fees for riding or walking. Coldwater Springs Golf Club18 hole championship golf course with driving range and practice facility. State Farm Stadium/Arizona CardinalsHome of the Arizona Cardinals and numerous other events. Phoenix International RacewayHome of Nascar Races March and November. Chase Field/Arizona DiamondbacksHome of the Arizona Diamondbacks. Veterans Memorial Coliseum/Az State Fair GroundsState Fair Grounds with annual attractions. Maryvalle Ballpark/Milwaukee BrewersMilwaukee Brewers Spring Training beginning last week of February, 2013 thru March, 2013. Desert Sky MallShopping Mall with a large selection of wonderful stores.